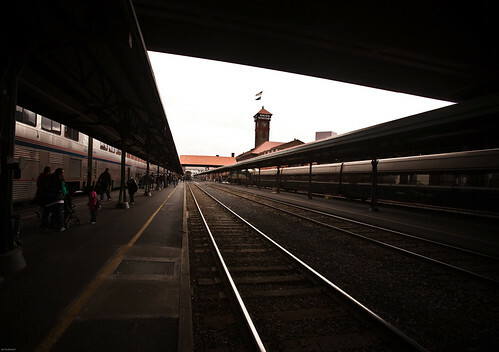 I recently took a trip on the Amtrak Coast Starlight from Seattle to Los Angeles, it was a very pleasent adventure. The trip to 30 hours and the train was on time or early all the way. I spent most of my time in the parlor car or observation car as the windows are larger and the views are better. By historical design the tracks go through cities and towns backyards. The tracks go through the back yards of homes, the old phrase, "the wrong side of the tracks" is made clear. It is sort of the back side view of the country. All of these shots were made on and from the moving train and I have kept the reflections and motion in tact on purpose. I hope you enjoy the shots, I really enjoyed the trip. On the way, on the Amtrak Coast Starlight to Los Angeles.